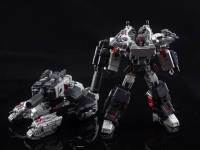 Third party company Iron Factory updated their weibo with more images of their upcoming figure Tyrant. Tyrant homages the Decepticon Leader, Megatron. This figure comes with several accessories to make him your preference of the character; a pre war miner Megatron, Stormbringer, G1 styled, or a more modern looking design. It also looks like he will be out soon because of the in box image that was also shown off today. Lastly Tyrant comes with a set of replacement hands for Starwing, Iron Factory’s take on Starscream. Check out all the images after the jump.